My research interests include octopus behavioral ecology and functional morphology. I earned a Bachelor of Science degree in Marine Biology from California State University, Long Beach in 2013, and a Master of Science degree in Environmental Science from Alaska Pacific University in 2016. My full research background may be found on my personal website. 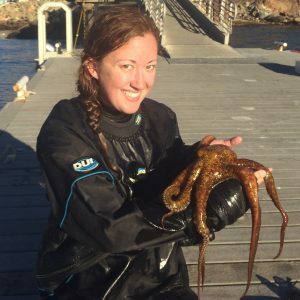 My upcoming studies in the Mehta Lab revolve around the functional morphology of octopus beaks, and predator-prey interactions between the California moray (Gymnothorax mordax) and the California two-spot octopus (Octopus bimaculatus) on Santa Catalina Island.